Is Your Subconscious Mind Pushing Clients Away? FREE Video Training. Is Your Subconscious Mind Pushing Clients Away? You may want more clients consciously. But is your subconscious mind actually pushing them away? Could you be sending subliminal messages that repel your potential clients? Are You Subconsciously Pushing Clients Away? I have worked with clients for 20 years now, and I’ve discovered that in certain circumstances, they’re actually repelling clients even when they say they want more. It often happens when they’re facing burnout, or when they’re afraid of making more money, or when they think they don’t have room for new clients. Some of them are afraid of being visible and attracting criticism. 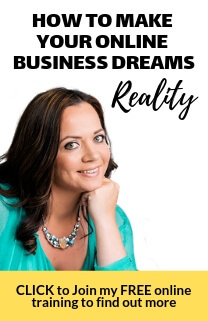 I’m about to dive deeper into these 4 common situations, during which business owners often push new clients away with their subconscious mind. And if you know me, you know I’m also going to share some solutions to these problems! The first reason I see business owners pushing clients away is because they begin to feel overwhelmed with everything they already have going on. It’s almost as though they hang out a “closed for business” sign! If you’re experiencing burnout, you may not be magnetically attracting new clients. The solution: Streamline and automate some of the work you’re doing now. Leverage. Offload. The second reason I see business owners pushing clients away is because they don’t trust themselves. Often I see this in the area of money. They don’t really want the extra business, because it comes with a big tax bill. Or they already have problems with the money they do have – so why would they want more? If you don’t trust yourself, you may be subconsciously pushing clients away. The solution: Get a strong financial foundation in place. Track your income and expenses, and get confident about taking on new clients. The third reason I see business owners pushing clients away is because they often think they don’t have room for another client – physically or time-wise. Maybe they don’t have the space to store more files, or they don’t have any openings in their calendar. If you don’t think you can grow your business, your subconscious mind may be keeping you from doing so. The solution: Clear up and clear out! Clean up your paperwork, clear your calendar of the things that aren’t absolutely necessary, and give yourself the chance to take on more clients. Finally, I see business owners pushing clients away when they fear becoming more visible, and attracting more criticism. Being a business owner can feel vulnerable, can’t it? I get it. I’ve experienced criticism, myself. But if you’re afraid of it, you can’t possibly grow your business, or your confidence. The solution: Feel the fear of criticism and vulnerability, and step up anyway. Your clients will mirror you – you can’t expect them to show up until YOU show up. Learn to celebrate the criticism you receive – because it means you’re stepping up again. Look, when your subconscious mind is squared away, it’s like you’re a taxi for hire with a sign that says “available!” Incorporate these tips and you’ll find your sign is fully on and blazing. What inner patterns have you seen showing up in your client attraction techniques? What actions will you take this week to change that? Share in the comments section below! This week on #BTV ~ Is Your Subconscious Mind Pushing New Clients Away? Great video.